This luxury two bedroom duplex penthouse apartment has accommodation set over two levels and briefly comprises communal front door with telephone security entrance system giving access to the hotel style lobby area with lift rising to the the top floor, private front door giving access to a spacious reception hallway with study area and access to the wrap around sun terrace. Superb light and airy lounge/dining room again having access to the wrap around sun terrace. Quality modern fitted kitchen with granite work tops and built in Neff appliances, double bedroom and a luxury shower room/WC. 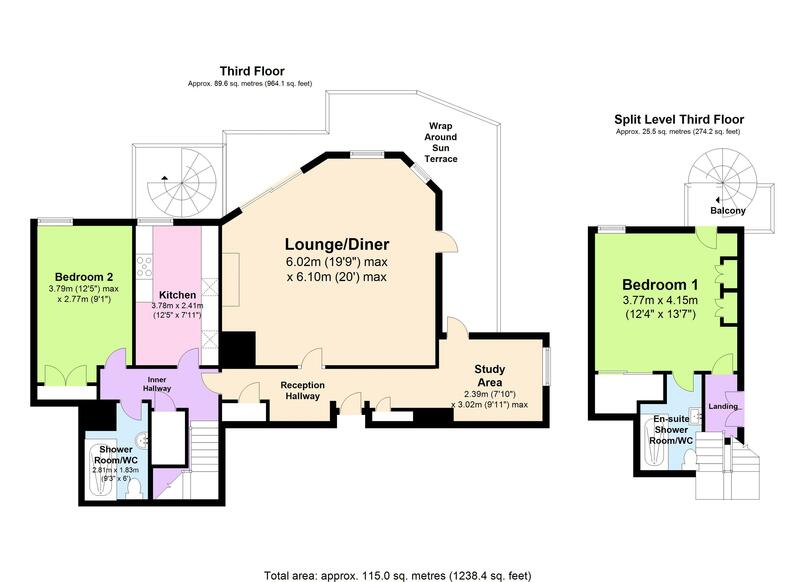 On the first floor there is a most useful storage area with the master bedroom having built-in wardrobes and a luxury en suite shower room/WC with access to a raised upper floor balcony and feature spiral staircase leading to the lower wrap around sun terrace. Outside there is superbly maintained communal gardens, visitor parking, allocated parking for one car and a single garage. Sitting on the cliff top at Livermead the Headlands is considered to be one of Torquays premier developments of residential apartments. Its spectacular setting allowing the fabulous views of Tor Bay with the gardens and grounds running to the cliff edge and available exclusively for the enjoyment of the residents. Designed for a discerning purchaser and recently refurbished to a very high standard is this penthouse two bedroom duplex apartment which is all electric and provides a stunning individual home with spacious accommodation. The building is presented in good order with a day to day attention of the resident care taker ensuring a high standard is maintained. Torquays harbour side with the deep water marina is approximately a mile and a half distance with access to the town centre with its array of shops, facilities and amenities. There is also easy access to the bypass which connects Newton Abbot, Exeter and the M5 beyond. It is also close to near-by main railway links at Newton Abbot which has access into London Paddington. An internal inspection is essential to appreciate the size, position, condition, views the accommodation boasts.